Meanwhile, mix dressing, 1/4 cup of the parsley, the lemon zest and juice until well blended. Remove 1/4 cup of the dressing mixture; set aside for later use. Pour remaining dressing mixture into large resealable plastic bag; add chicken. Seal bag; turn over several times to evenly coat chicken with the dressing mixture. Refrigerate at least 2 hours. Preheat grill to medium heat. Remove planks from water; brush tops with oil. 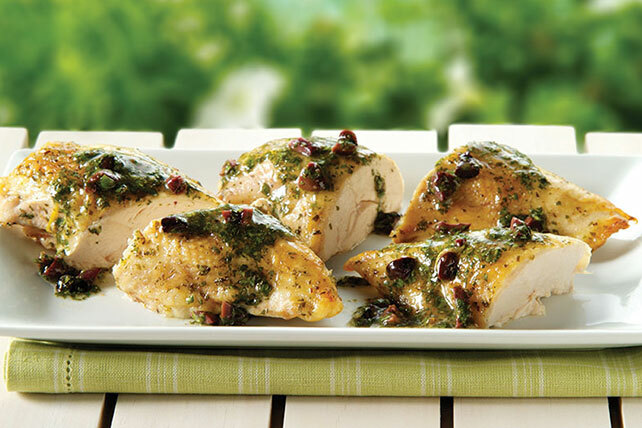 Remove chicken from marinade; discard bag and marinade. Place 2 chicken breasts on each plank. Place on grate of grill; cover with lid. Grill 1 to 1-1/4 hours or until chicken is cooked through (165ºF). Meanwhile, mix reserved dressing mixture, remaining 1/4 cup parsley and the olives. Remove chicken from grill; discard planks. Remove bones from chicken; cut each breast in half. Serve topped with the parsley mixture. Serve over hot cooked couscous or basmati rice. Round out the meal with grilled fresh vegetables. Omit marinade mixture and olives. Prepare planks as directed. Combine 2 Tbsp. KRAFT Balsamic Vinaigrette Dressing, 2 tsp. each ground cumin and ground ginger, 1 tsp. each ground coriander and ground turmeric and 1/2 tsp. ground red pepper (cayenne) to form a paste. Rub onto skin side of chicken; cover. Refrigerate at least 2 hours. Preheat grill as directed. Grill chicken 1 to 1-1/4 hours or until cooked through, brushing occasionally with additional 1/2 cup KRAFT Balsamic Vinaigrette Dressing.